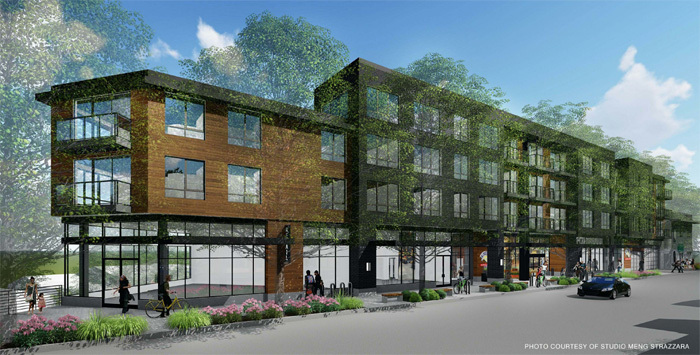 The developer of a contentious six-story mixed-use development that will include a PCC Market in Madison Valley has applied for a master use permit with the Seattle Department of Construction and Inspections. “I think we’re down to the planner just writing the MUP letter,” said Charles Strazzara with architecture firm Studio Meng Strazzara, adding a decision could be made any day now. The Madison is slated to replace City People’s Garden Store at 2925 E. Madison St., and include 82 residential units, a 24,500-square-foot PCC Market and a 1,500-square-foot corner retail space. Since clearing the East Design Review Board in September 2017, Studio Meng Strazzara has been addressing various corrections to land-use reviews by SDCI, which in February sought additional information on setbacks, confirmation of a 5-foot dedication of right-of-way space on East Mercer Street, a minimum 22-foot-wide curb cut width on Dewey Place East and a corrected Frequent Transit Service Corridor report for Saturdays and Sundays. The Madison will have 140 parking stalls, with retail parking and commercial loading on East Madison, while residential parking will be accessed on Dewey Place East, which will also have six two-story townhouses as part of the project. It’s unclear when SDCI might issue Velmeir Companies (TVC Madison Co., LLC) a master use permit to begin construction. Neighborhood group Save Madison Valley fully intends to appeal the decision within the 14 days allotted once the permit is issued, said SMV member Melissa Stoker. Stoker tells the Madison Park Times the group doesn’t think it will stop the development, but it wants to ensure The Madison follows design guidelines and appropriately addresses the increase in traffic the PCC Market will cause on East Madison Street. Stoker said, with Madison Bus Rapid Transit set to create a Rapid Ride G line up East Madison Street, the city should have considered making the developer reduce the amount of parking attached to the project, but didn’t. Engineers have estimated the residences and PCC Market will generate more than 2,000 daily trips. However, the report noted that East Madison Street would also lose about 766 trips with the loss of City People's. Save Madison Valley will dispute the loss of one exceptional tree, she said, as well as the loss of a tree canopy on Dewey Place East. The owners of City People’s Garden Center are still looking for a new location, and have a lease agreement to stay on East Madison Street through June, and then will have the option of renting month to month until construction requires them to vacate. The Madison Park Times will post updates on the development as they become available.